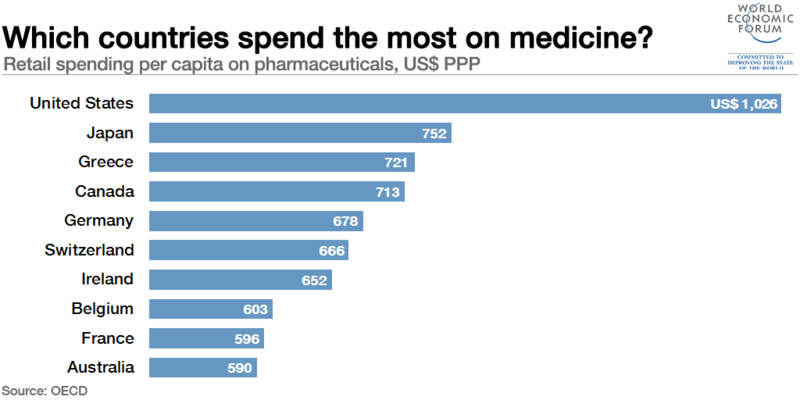 U.S. prescription drug prices are some of the highest in the world. 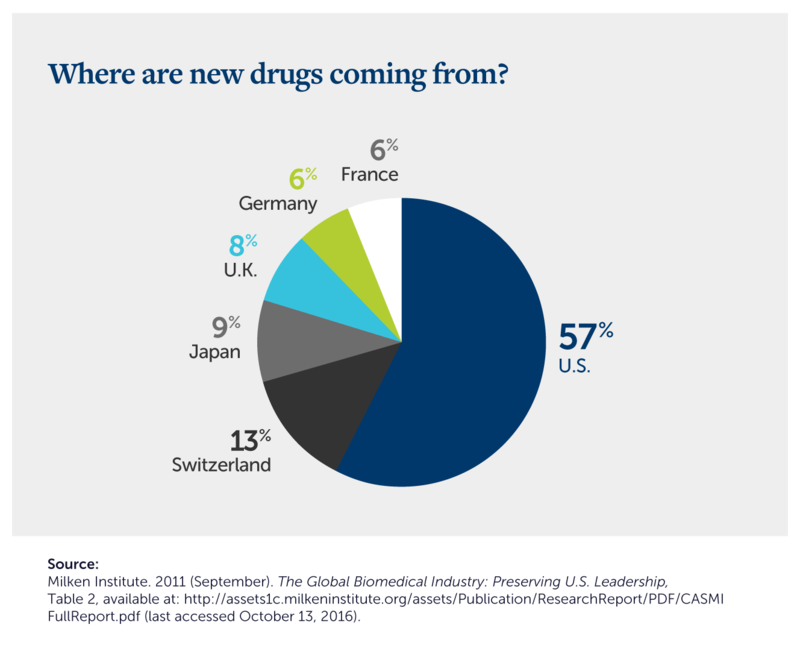 But have you seen this chart, which shows the country of origin of the world’s prescription drugs? It’s true that Americans’ per-capita spending on prescription drugs is more than twice the OECD average. But it’s also true that we develop a sizable majority of the world’s drugs. This situation is a product of our country’s unusual drug industry and the unusual policies, incentives, and pricing models that have shaped it. Why are prescription drug prices so high? And who is profiting from those high prices? We’ll also show you how, with the right biotech investing knowhow, you can be on the receiving end of our country’s unusually high prescription drug spending. The U.S. doesn’t regulate drug pricing, and the Center for Medicare and Medicaid Services — the largest single customer for many drug companies — is legally forbidden from haggling down the prices of its purchases. Some people, especially those who are trying to make a political point, end the explanation here. They claim that America’s unusually high prescription drug prices are the result of corporate greed, plain and simple. And they often cite notorious price-gouging biotech executives like Martin Shkreli as examples of that greed. A much more important driver of U.S. drug pricing is the fact that drug companies have to pick up the tab for the entire drug development process. That process, which I detailed in an article last month, can take years and cost billions of dollars per drug candidate. And it’s no guarantee of approval. In fact, less than 14% of drug candidates make it from Phase I clinical trials to approval. When candidates fail to win approval, drug companies have to recoup the money they wasted on those failed candidates. They do this by setting high prices for drugs that do win approval — and by protecting those drugs with patents. In other words, the real reason your medicines cost so much is that you’re not just paying for your medicines. You’re also paying for the costs of all the failed drug candidates that the drug industry went through in the process of developing your medicines. As we discussed above, approval decisions are make-or-break events for drug companies. They’re constantly blowing huge sums of money on drug candidates that may never earn them a dime of revenue. And their only shot at solvency — not to mention profitability — is to make sure some of those candidates get approved, patented, and marketed at a high price point. Since the stakes are so high, drug companies often see their stock prices soar upon drug approval announcements and positive clinical trial results — or crater upon rejection announcements and negative trial results. This is especially true for small, early-stage biotech (NYSEARCA:IBT) firms that only have one drug candidate in their pipeline. 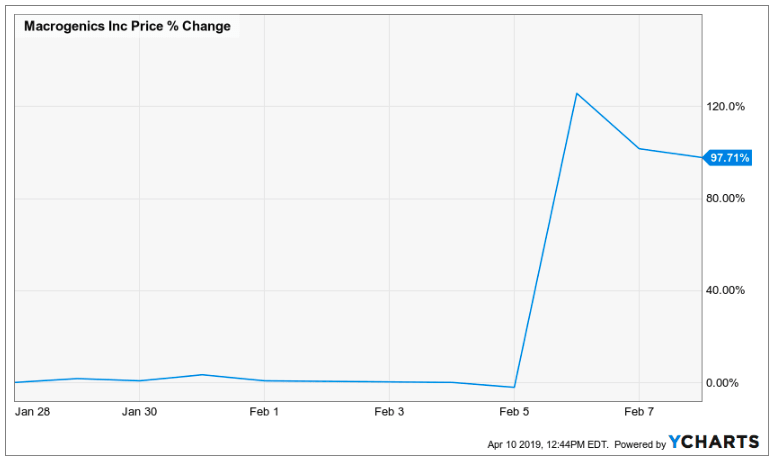 For these firms, approval or positive results can mean hitting the jackpot, as you can see in this graph of the stock price of MacroGenics (NASDAQ: MGNX) after the release of positive Phase III trial results for its breast cancer drug Margetuximab. Rejection or negative results, on the other hand, can quickly send a stock toward zero. 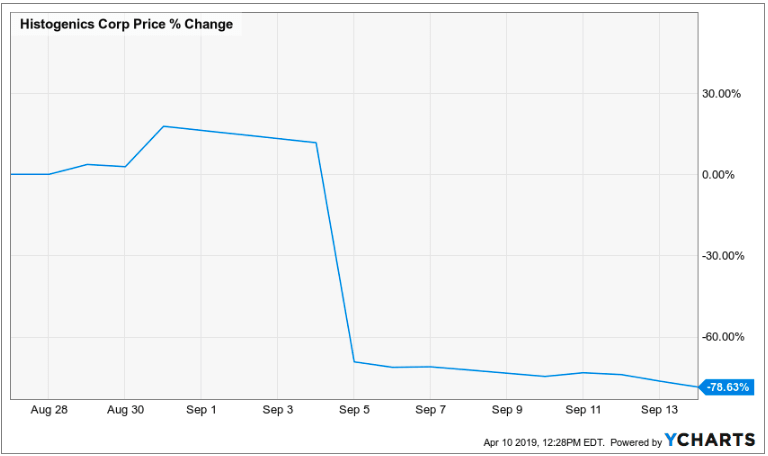 That was the case for Histogenics Corp. (NASDAQ: HSGX) last September when its knee cartilage repair drug NeoCart failed to meet its primary endpoint in Phase III clinical trials. So who profits from high drug prices? Shareholders of successful early-stage biotech developers, that’s who. You could be one of these lucky shareholders… if you can pick the winning drugs out of the hundreds of candidates that are clinically tested each year. Needless to say, that’s easier said than done. As we mentioned earlier, a drug candidate in Phase I clinical trials has less than a one-in-seven chance of winning FDA approval. And even highly effective drug candidates present challenges to investors. Early-stage biotech stocks can skyrocket on good news from the drug approval process, but it’s difficult to predict in advance exactly when they’ll skyrocket. Phase II and III clinical trial results, acceptance into an FDA fast lane program, New Drug Application (NDA) acceptance, and FDA approval can all serve as catalysts for stock price jumps… or not. The only reliable forecasters of these events are biotech industry experts — the bench scientists, doctors, executives, and compliance staff who work in this world full time. Wealth Daily contributor and Topline Trader founder Jason Stutman has assembled a network of more than 250 biotech experts over the last few years. And he’s used this network to develop a biotech trading system that picks out winning drugs and market-moving catalyst dates with an astonishing degree of accuracy. Next week, in his Topline Trader Summit, Jason will tell you how this revolutionary biotech trading system works — for free. Click here to sign up.